So it would stand to reason, then, that living by a major express stop on the subway might mean paying extra for the privilege of a more streamlined commute, right? Apparently, not quite. 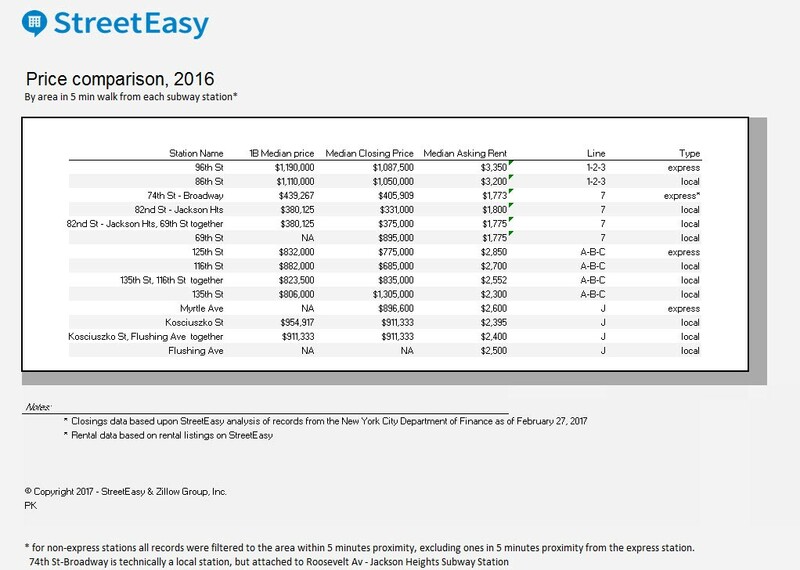 We asked StreetEasy to pull some numbers for a few of the city's biggest transit hubs, and for the most part, neither renters nor buyers will see much of a price gap for living near an express station versus one of the local stops nearby. You can see the full data below (click to enlarge the image). 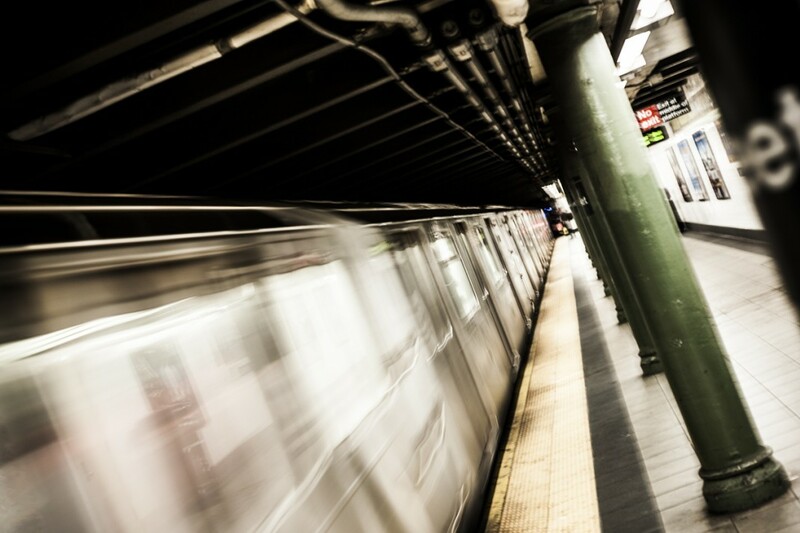 A note on methodology: StreetEasy looked at four major express stops—96th Street on the 1, 125th Street on the A/B/C/D, Myrtle Broadway on the J/M/Z, and 74th Street-Broadway on the 7—as well one or two local stops near each one. They analyzed sales prices using closing data for all types of homes from 2016, and rental prices using numbers from their 2016 listings database. While there does seem to be a minor price bump in a few categories (sales and rental prices off 96th Street, in particular, as well as rentals near Myrtle Broadway and 125th Street), the difference isn't especially dramatic or consistent. 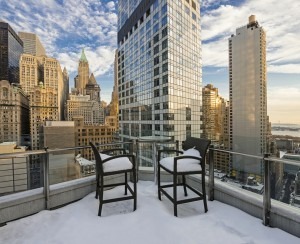 For instance, while rental prices are higher near Myrtle-Broadway, sales prices are lower compared to nearby local stops, and the same effect can be seen at 125th Street versus 135th Street, and 74th Street-Broadway versus 69th Street. 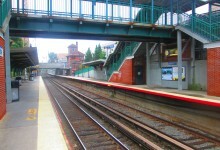 "While the data shows a price premium at the 96th Street express station compared to the nearby 86th Street local station, this is more likely speaking to the array of amenities available in this area of the Upper West Side than it is to the price tag placed on a convenient commute," explains StreetEasy spokesperson Lauren Riefflin. "The Upper West Side really comes alive around 96th Street—there are restaurants galore, retail stores, and even a Whole Foods. The other express stops included in this analysis don’t have the same shopping and dining options." 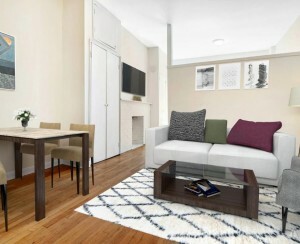 And as for the local stops that are actually higher priced than the nearby express options, explains Reifflin: "Other local stops with prices that exceed their express stop counterparts, like those in Harlem, get a real estate boost from convenient access to parks and quality housing stock including eternally sought-after brownstones." And apparently, this phenomenon isn't necessarily limited to these particular stops. "I personally don't think that express versus local is really what makes the difference in terms of price range," TripleMint agent Josh Juneau tells us. "But one of the biggest factors is the commute to the train—if you're closer to the train, regardless of whether it's express or local, prices will be higher." 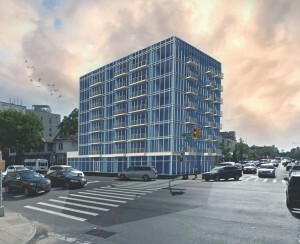 "A lot of people just take the local and transfer to the express, so you're not really seeing a premium being charged for apartments near express stops," Juneau adds. 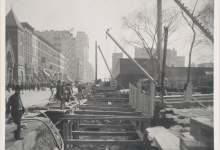 However, he notes, for apartments near the new Second Avenue subway Q stations on the far east side, prices are likely to spike, but mainly because the walk to the train has essentially been cut in half. "It's not because it's express, it's because it's a train, period," he tells us. Bottom line, according to Juneau: "The closer you are to the train, the more expensive your rent is going to be, whether it's express, local, or even a shuttle." Something to keep in mind next time you're mapping out potential new apartments—or negotiating with an overly ambitious seller or landlord.